Small companies, among the market’s biggest winners since Election Day, led a cascade of records for U.S. stock indexes Monday. Investors betting that Donald Trump will roll back regulations and taxes while pumping money into infrastructure projects drove the Russell 2000 index of small-capitalization stocks to a record with its 12th straight session of gains, its longest winning streak since June 2003. The index has risen 11% since Election Day, outpacing the S&P 500’s 2.7% climb. The Dow Jones Industrial Average, the S&P 500 and the Nasdaq Composite Index also closed at records on the same day for the first time since Aug. 15. The last time the four U.S. stock indexes closed at records on the same day was Dec. 31, 1999. Hopes for a pro-business combination of a Trump presidency and Republican Congress have lifted stocks broadly. But some analysts think smaller companies could benefit even more, because they are less exposed if Mr. Trump takes a more-protectionist approach to trade and if the dollar continues to rise. Either development, along with the backlash against globalization seen in the Trump and Brexit votes, could hurt multinationals and leave smaller, domestic companies relatively better off. “In each of these instances, small-caps benefit the most,” said Jason Pride, director of investment strategy at Glenmede, a firm that is considering adding to its holdings. Stocks in the Russell 2000 had an average market capitalization of roughly $1.8 billion at the end of October, compared with the S&P 500’s average of nearly $40 billion, and they often swing more violently. Small-caps fell behind the S&P 500 when fears of a U.S. recession sent stocks plunging in January and early February. The beneficiaries of the recent rally include Tutor Perini Corp., whose shares have surged 31% since the election. 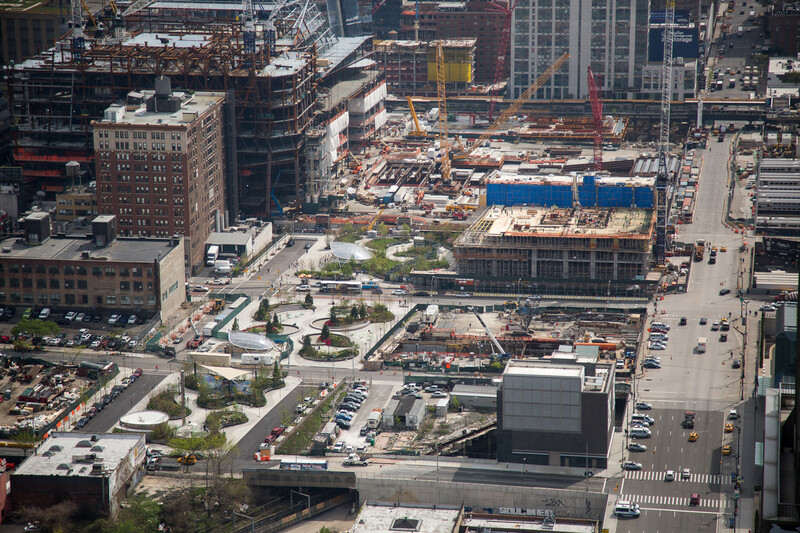 The Sylmar, Calif.-based construction firm is working on the Hudson Yards real-estate development on Manhattan’s West Side and helping dig a tunnel under the Seattle waterfront using “Bertha,” the world’s largest-diameter tunnel-boring machine. More than 95% of the company’s revenue comes from the U.S., according to FactSet estimates. 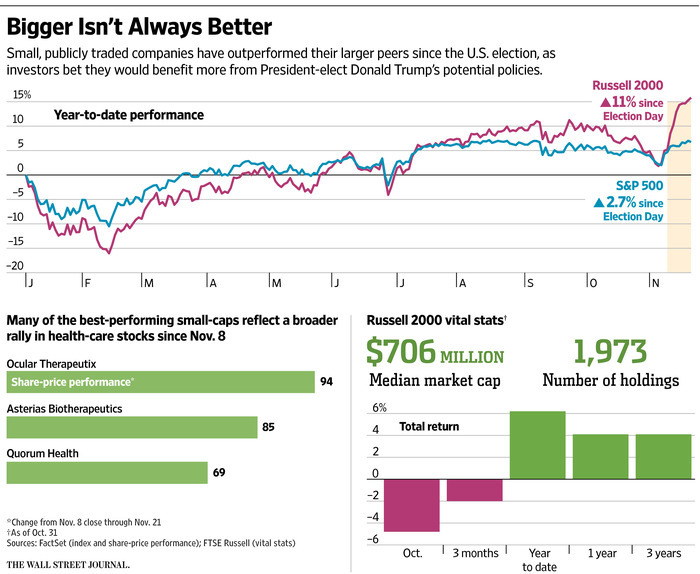 The bet on small caps is a speculative one, however. Little is known about how closely the incoming administration’s priorities will line up with Mr. Trump’s campaign rhetoric. Mr. Trump on Monday released a video outlining some moves he would make in his first days in office, including pulling out of the proposed Trans-Pacific Partnership trade agreement reached in 2015. The sudden gains have raised concerns that investors are chasing returns rather than betting on the fundamentals, adding to worries that a number of popular trades since the election, such as selling in government debt and a surge in bank stocks, could reverse once there is more clarity about the direction of U.S. policy. A similar dynamic is playing out among larger companies. Shares in S&P 500 companies with more than 90% of their revenue from inside the U.S., such as Kroger Co., have climbed 5.4% since the election. Shares in companies that generate the majority of their revenue outside the U.S., like International Business Machines Corp., have edged up 3.1% in the same period, according to research firm Bespoke Investment Group. “If they get tough on trade policies, the price of imported goods goes up, and American businesses are more competitive,” Mr. Pride said. Deregulation and tax cuts can also disproportionately benefit small companies, as they tend to pay a greater share of revenue in taxes and regulatory costs, he said. Then small-caps outperformed the S&P 500’s climb to highs after the U.K. vote in June to leave the European Union. The S&P 500 rose 6.8% from its June 27 trough to its first record close of the year on July 11. The Russell 2000 gained 9.2% over that time. Mr. Trump’s proposal ​for $1 trillion in new infrastructure construction has lifted a range of companies. They include large-caps such as Caterpillar Inc. and Union Pacific Corp., as well as Scorpio Bulkers Inc., a smaller shipping company that could help carry the raw materials needed for an infrastructure buildout. Scorpio’s shares are up 44% since Election Day. They were down 64% in 2016 heading into the election. Robert Bugbee, Scorpio’s president, said a postelection surge in commodities prices had also helped boost shares, as well as economic data showing growth in China and Japan. Tutor Perini has also benefited from hopes of infrastructure spending, but it hasn’t been all smooth sailing. On Oct. 24, S&P Global Ratings revised the company’s outlook to “negative” citing its “weaker-than-expected operating performance over the past year,” in part because of a loss taken on its Hudson Yards project. About a week later, Tutor withdrew a $500 million bond offering that would have been used to refinance existing debt after investors balked at the roughly 7% interest rate it had proposed as too low, according to people familiar with the situation. The company cited “adverse market conditions,” though investors have generally been hungry for higher-yielding debt in recent months. A spokesman for Tutor Perini declined to comment Monday. Several analysts said small-caps were poised to outperform for the rest of 2016, particularly as fund managers look to beef up year-end figures. George Young, partner at Villere & Co. in New Orleans, said he bought shares of First Hawaiian Bank and DST Systems Inc., a financial-technology company.